This week’s Cloak & Dagger starts with a splash as it picks up right where it left off in last week’s episode. The long-awaited talk between Tyrone and Tandy has finally arrived and it packs a wallop that was well worth the buildup. The scenes with Tyrone and Tandy in the church are intercut with the two with their respective families. Tyrone struggles with the growing distance between him and his parents, while Tandy forges a tenuous bond with her mother, Melissa, over their shared grief of her father. Tyrone admits to Tandy that fear has always been something that has driven him, and he thinks that’s why he saw visions of her. Tandy asks if he has ever had a similar experience, and he reveals that has has twice before, once with his mother and the other the night his brother died. This leads to a discussion about their powers and where they come from. Tyrone doesn’t understand how his powers manifest and why he ends up in random places. Tandy theorizes that his powers keep bringing him back to the cop that killed his brother, but Tyrone thinks they keep bringing him back to her. He thinks the powers guide and protect him. When asked about her powers Tandy tells him that she doesn’t know what it is, but that when things get bad and she feels hope slipping away she gets all hot and bothered…and weaponized. Tyrone admits that if he had that power the cop that killed his brother would be toast. And Tandy admits that if she had his powers she would be gone and she would never look back. That’s when they realize that they were given their specific powers for a reason. As they become more comfortable with their powers they decide to test what happens when they touch. In one of the more intense moments in the episode, after circling each other for a few moments they both stop, close their eyes, and reach out to touch the other. They are both immediately flung to opposite ends of the room by the force of the connection. The last scene in the church between Tyrone and Tandy is intense. Tandy nurses a bottle of wine, that Tyrone won’t touch, and he explains to her that what they have is called survivor’s guilt. She asks him if he feels guilty and he says yes. He admits that he feels like he has to be perfect and do everything right so that he can make up for two lives. On the flip side, Tandy tells him that she wishes that she was the one who died instead of her father. Tyrone doesn’t believe that things are so bad that Tandy should choose death, but she admits that she thinks about suicide a lot. This upsets Tyrone and he reminds her that she has a life and opportunities so she shouldn’t want to kill herself. She claims that she doesn’t want to do it, but sometimes life gets hard and the thought had crossed her mind. Tyrone calls her out for wanting to teach him about being a thief and a con-man and then he tells her to check her privilege. She balks at that suggestion, telling him that she’s had to steal to get everything she’s had, and he counters her argument by telling her that she got away with what she did because she could. She could be a thief and never get looked at twice, but he can’t walk through a department store without being noticed and followed. Tandy tells him that’s not fair but he’s not trying to hear it. He continues dropping truth bomb after truth bomb, including the fact that as a black man in America the whole country is trying to kill him. So he doesn’t have the luxury of contemplating suicide, but if she wants to die so bad then she should go do it. Tandy reminds him that she walked through his hopes in her vision and based on what she saw he has no place on his high horse. She watched him make the same decision over and over again that lead to his death at the hands of a police officer. So she reminds him that suicide by cop is still a death wish. The two part ways with a lot anger and awful words hanging between them, and the tenuous bond they formed seems irreparably damaged. 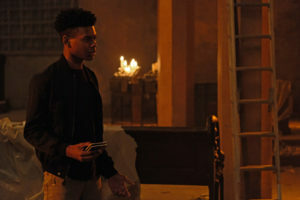 Another solid episode, Cloak & Dagger continues to push the envelope in new, exciting, and unexpected ways. 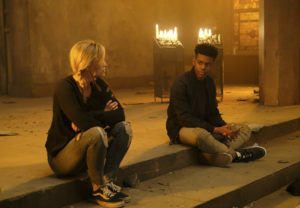 Cloak & Dagger airs Thursdays at 8/7c. on Freeform.